GLENDALE -- The Portland Pirates lost their 2012-13 American Hockey League season opener on Saturday, but Head Coach Ray Edwards really liked what he saw from his players for the first half of the 6-3 defeat to the Adirondack Phantoms. 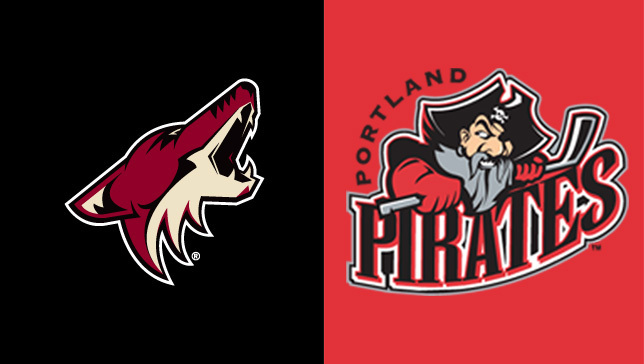 Ethan Werek, Oliver Ekman-Larsson and Andy Miele scored goals for Portland, which led 1-0, 2-1 and 3-2. But Adirondack scored four unanswered goals, including two power-play goals and an empty-netter to secure the victory. Pirates goalie Chad Johnson stopped 42 of 47 shots he faced. Edwards said Miele, who also chipped in an assist and several key face-off wins, played an all-around good game. He also said captain Alex Bolduc, Jordan Szwarz, Chris Conner, and Chris Brown all made an impact on the game. In addition to taking nine penalties, the Pirates played with only four defensemen for a while in the third period because Michael Stone and Chris Summers had to leave because of concussion protocol. On Monday, Edwards said Stone is expected to play this weekend and that Summers is considered day to day at this point. The Pirates next play on Friday when they host Worcester in Lewiston, Maine. It will be one of six “home” games the team will play away from Portland because of ongoing renovations to the Cumberland County Civic Center. On Saturday, the Pirates will play at Manchester. Edwards said goalie Mark Visentin would likely play one of the two games this weekend. Center Jordan Martinook is not expected to play this weekend as he continues to recover from a lower-body injury he suffered in an exhibition game. To add depth at center, the Pirates on Monday signed Evan Brophey, a five-year AHL veteran, to a professional try out. Brophey has notched 62 goals and 85 assists in his AHL career.